This interactive presentation contains the latest oil & gas production data from 10966 selected horizontal wells in the Permian (Texas & New Mexico) that started producing since 2010 (2009 for New Mexico), through January 2017. Unlike the other tight oil basins, oil production in the Permian has continued to rise over the past 2 years. The wells that started production in 2015 and 2016, though fewer in number, contributed more new production by the end of these years than the 2014 wells did, as the graph above shows. You can see this in more detail if you hover your mouse over (or tap on) the December months of each of these vintages, after which a tooltip will reveal both the well count, and the oil production from these wells. Once revisions are in, I expect that we will see that the rise in production has continued in the last few months shown in this graph. The steady increase in output from this basin can probably for a good part be explained by the well production profiles shown in the “Well quality” tab. The improvements in productivity over the years are clearly visible here, and, also unlike the other oil basins, they have not been confined to the initial couple of months. A number of factors are behind these increases in well productivity and total production, such as longer laterals and larger frac sizes. On the last point; based on FracFocus data, it appears that the water volume used per completion in New Mexico increased from below 1.5 million gallons in 2012/2013 to more than 7 million gallons in early 2017. This increase was similar in Texas, where the average completion now uses more than 10 million gallons of water, triple of what it was in 2013. I expect that the amount of proppant used has increased with a similar proportion. The graph reveals the clear progression in improvements of these trajectories over time, for both oil and gas. It will be interesting to see whether this trend can continue, now that operators have started to complete more wells. You can also see the increase in well productivity over time in the 5th tab (“Productivity over time”), as measured by the average cumulative production in the first 2 years on production. The rise is even sharper if you measure this metric by a shorter duration, as still most of the effect of increased frac sizes takes place in the early months. By Wednesday I aim to have a new post on all covered US states, followed by another update on North Dakota. Look at the Performance for the Permian 2016 and 17 wells by month if you exclude Martin and Reeves County. Very exponential, performance stacks, and 200 MSTBO looks like a stretch. 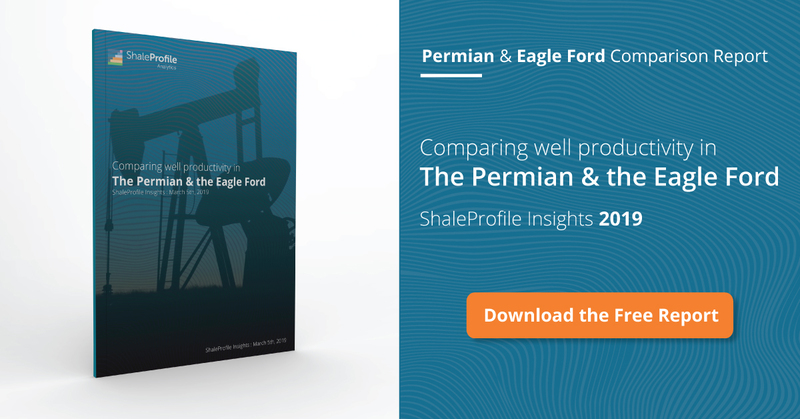 Although Martin and Reeves County are about 1/4rth of Permian production, the charts below illustrate the impact they have on average well performance. On the left, Martin and Reeves are selected from the Ultimate Recovery window. On the right they are excluded. The red circles are reference points to an Apache 2014 simulation presentation which results in a cumulative recovery of about 250 MSTBO at 10 BOPD. Martin and Reeves 2016 and 2017 wells have a good chance to exceed this theoretical behavior, while the right hand wells do not. That’s cool, Jim; thanks. I hold that at $53 hedged oil prices the weighed net back price, or take home pay per barrel of oil, after taxes, royalty deductions, incremental lift costs per BO, not BOE, G&A and interest expenses (from 201610K’s) is something in the order of $25.00. For what I believe are typical Permian well costs of $8M, a well like that will require 320M BO to payout. Anecdotally, I flew over the Permian a few nights ago, an west-east cross section through both basins, and believe there must be billions of MCF’s of gas getting flared; the magnitude of waste occurring was quite remarkable, actually. Seems that Pioneer’s 2014-2015 wells in the Midland county also don’t look like to break apart from the destiny set in 2013 — EUR less than 250K BO will be hard to top. Interesting findings Jim, thank you for sharing this. As you show here, and as I also found for other basins, the overall trends shown in my high-level graphs do regularly hide remarkable sub-trends. For example, it sometimes appears that well productivity is improving, when in fact operations are just moving towards a more productive area (high-grading). I sometimes use the “Cumulative production ranking” overview to figure out what are the most productive counties/fields/formations/operators, and then use the “Well quality” or “Ultimate recovery” overviews to see if there are interesting trends in performance to be found for only these wells.